Our aches and pains from participating in the Baxter’s 10K Corporate Challenge last month all felt worthwhile when we were able to hand over this handsome cheque for £2911.53 to CHAS, Children’s Hospices Across Scotland. But although we may have done the running (and in some cases some walking!) but we couldn’t have raised that sum without the support of you, our friends, families, and associates. The target for our fundraising was ambitious at £1000 but we managed to smash that for CHAS, thanks to your generosity. To boost our fundraising, we teamed up with our neighbours in Chapel Street, The Grumpy Chef and Inverness Coffee Roasting Company, to hold a coffee morning in our service room. Other donations for CHAS came in through our JustGiving fundraising page, and from cash donations that were handed in to our offices in both Inverness and Dingwall. 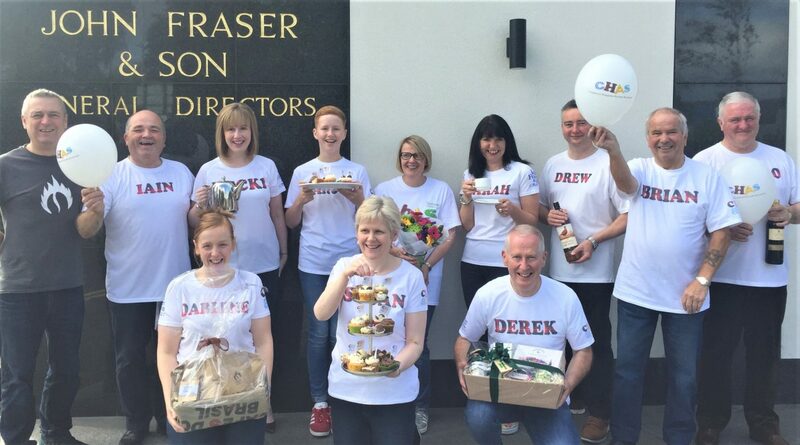 The coffee morning and the 10K were a whole-team effort from the staff at John Fraser & Son, with everyone doing their bit from baking, blowing up balloons and setting up the service room for the teas and coffees, to pounding the streets in the run-up to the 10K, and cheering on those who took part in the race. And we have all been humbled by your generosity. We know that the money raised will go a long way towards helping CHAS with their vital work in our area. The support and care they provide for families with children who have life limiting conditions makes such a difference, and we are delighted that you have helped us to help them.